Acrylic painting on stretched canvas. 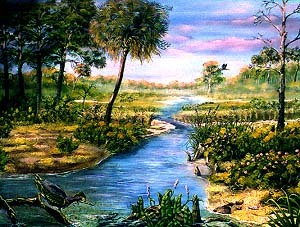 Scene depicts a spring fed stream in the early morning. Also in picture is a deer and a great blue heron in flight. There are Indian artifacts in the foreground as well.